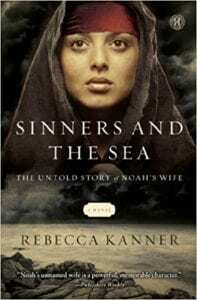 Rebecca Kanner delivers a poignant and compelling story in her debut novel, Sinners and the Sea, as she casts a light and provides a distinct voice to the nameless, Biblical woman, Noah’s wife. She is an innocent child who was born with a grotesque birthmark over her brow—a defect that creates a stigma and perception of evil to all who come in contact with her. Committed to delivering her to a worthier life, her father’s mission is to release her from the painful existence that smothers his only child. When 600-year old Noah arrives in their village, her father betroths his only daughter to Noah. Reality hits hard when the thought occurs he may never see his daughter again as he watches the two disappear over the horizon. Noah and his new bride are destined for Sorum; a community full of violence and sexual sinners. As their lives together unfold and Noah’s wife delivers his three sons (Ham, Shem, and Japheth), she realizes her only true companion is loneliness. Noah converses far more with his God than with her as he preaches God’s message to the ill begotten dwellers of Sorum. Left to her loneliness, Noah’s wife attempts friendship with members of the fallen people of Sorum to no avail. After many failed attempts, she focuses her attentions on the rearing of their three sons. What comes as somewhat of a shock, however, are the signs of their sins despite the self-righteous upbringing they were exposed to. When Noah’s God informs him of plans to destroy the world by flood, Noah follows His specific instructions to build an ark. The construction of the vessel was the necessary key to the salvation needed for his wife, three sons, their wives and a bevy of animals in order to repopulate the new world. What none of them could possibly know, however, was the perilous journey they would navigate and endure to arrive at their new world. As they secure a stronghold on survival through the formidable forty days and forty nights, divine hope guides them in the end. Perhaps the only faith they needed was to believe their destiny truly was in the hands of the God Noah had spent his life’s devotion toward fulfilling—an unfaltering devotion to deliver His message to the people. Ms. Kanner has done an admirable job of breathing dimensional life into the nameless character of Noah’s wife. It is an honor to review authors who demonstrate confidence and command of their pen with eloquent style. Kanner is a true companion to her pen and while there are many scenes that depict clear pictures, one in particular truly grabbed my attention: “…Nothing but rain guards the ark. The only footsteps on deck are those of the clouds…” It is a pleasure to read the work of a fellow author who is able to deliver such depth to her work as a result of the careful placement of very few words. In my opinion, Kanner demonstrates her natural-born gift of writing in Sinners and the Sea. This was a well-written and captivating story. Quill says: Sinners and the Sea is a beautiful account of the importance of faith and perseverance as well as a strong message of learning how to rise above judgments as we endeavor to look beyond those who sit in judgment.